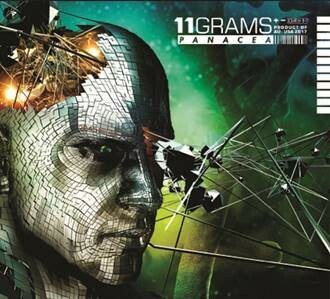 11 Grams is a futurist-inspired musical partnership between Simeon Fitzpatrick (Project K11, AUS) & Rob Early, sonic mastermind of the Washington DC-based electro – IDM band Retrogramme. This Australian/American duo created an addictive Electro/Industrial/EBM style with catchy bass riffs, complex melodies and precise hi-tech musicianship. The 12 episodes included on "Panacea" reveal sophisticated sonic geometries full of fascination and dynamism, that will capture all the estimators of advanced EBM. Unique rhythmic structures, futuristic melodies and android vocals, are the peculiarities of this absolutely exciting and technically perfect album. Of great interest are also the 3 versions produced by important names from the electro universe: Atropine, Daniel Myer and Xavier Swafford (3TEETH) who add further value to the tracks through their compositional genius. You can be sure that "Panacea" will leave an indelible imprint in your memory. What a majestic work!